Anniversary signifies a strong bond of trust, companionship and love. Gifting a bunch of flowers on anniversary occasion is the most romantic way to express love and care towards your partner. 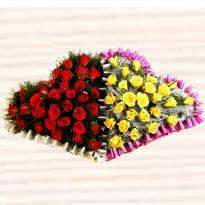 You can order and send anniversary flowers online in India without any delay. 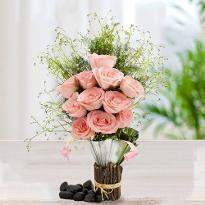 Choose our same day anniversary flower delivery facility and make your loved one feel extra special. We have orchids, roses, gerberas, carnations, lilies and gladiolus in different colors. 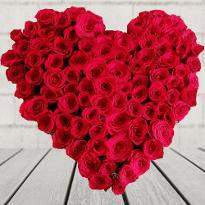 You can also shop for heart-shape and other arrangements of flowers. Flowers are the symbol of love and romance. There is no better way to express your feelings than by gifting flowers. 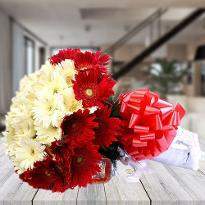 Who can fail to be elated when they open the door and find a bouquet of beautiful flowers with a romantic message? Flowers have a mesmeric beauty of adding an eternal smile on every face. It reflects upon the receiver’s beauty and intrinsic charms that just stop dazzle you. Send flowers to your soul mate on your anniversary from Winni that is sure to delight your special one like never before. Select the one you like and there is nothing which can stop you from the wide variety that we have with us. Love has been linked to the different color of flowers epitomizing different emotions. For instance, red represents true love, white represents the purity of soul, pink represents adoration and many more. Roses, carnations, gerberas, orchids or lilies you name it and we have it. Love has no definition and no age. Just express it with flowers! Flowers are said to be the classic gift that never goes out of style. 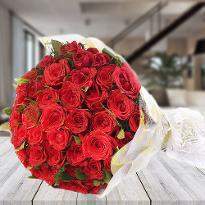 Your special one will feel your love and affection when he/she will receive the beautiful arrangement of flowers. 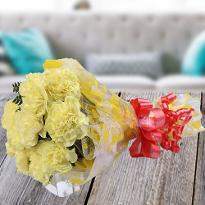 When you want to gift something dazzling and unique then flowers are the best choice. “Happy Anniversary” it’s truly amazing how these two simple words can describe the unconditional love shared between two people. With this in mind, we at Winni, created a unique category of anniversary flowers, cakes and gifts so that you don’t have to face a lot of trouble while selecting the anniversary gift. From beautiful anniversary flowers to anniversary cakes, we are here for you all the way to help celebrate your special love. A beautiful bouquet of fresh flowers can say so much on the anniversary. This is the reason we have created a unique category of anniversary flowers to be the best of the best. 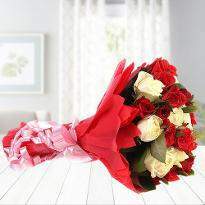 Select from a wide range of flowers and get it delivered to the doorstep of your special one. It’s not easy to decide what is the perfect anniversary gift that you can present for your soul mate. This is one of the biggest dilemmas that everyone faces. However, Winni is a platform which provides you the best anniversary gift for your better half. Scroll down our anniversary category to get the best gift for your better half. You can order a mouth-watering cake or a bunch of flowers or a combo that will surely delight your special one. Send 50th-anniversary flowers to your parents to wish a happy anniversary. We believe that we don’t just deal in flowers, but also a symbol of love, care and happiness. Moreover, our service reflects just as much as our products. Moreover, our service reflects just as much care as our products. We deliver round the clock, no matter it’s a day order or midnight. We also make sure that your flowers for the golden anniversary are just as fresh and lasting as your relationship. You can make sure that your golden anniversary celebration fills your partner’s eyes with the glow you fell in love with. The enthralling beauty of flowers can make every heart fill with love and happiness. Its essence can uplift any mood and make the day brighter. Flowers help to express the eternal love which is hidden in your heart. 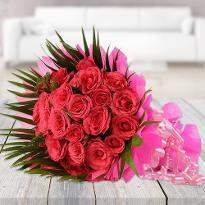 So, go ahead and order anniversary flower online to win the heart of your special one. Flower expresses a feeling that cannot be expressed only with words. The existence of flowers in itself is very delicate, they epitomize tranquility and personify elegance that can be admired and also presented as a token of love and affection. So conveying something through flowers can turn out to be the amazing gesture in this universe and flowers also have a remarkable history of never being turned down as a token of eternal love. Flowers are considered to be a classic gift and they can simply be the most appreciated gift for any occasion or celebration. Why choose Winni for Anniversary Flowers? Winni is an online brand who deals in fresh flowers, cakes, teddies and many more. You can get the perfect gift for everyone from the house of Winni. We also provide a special arrangement of flowers like the heart-shape arrangement, 2-tier arrangement of flowers that you can gift to your loved one. Our services are swift and we are prompt in delivering orders at the specified location. We provide pocket-friendly products that you can gift to your near and dear ones. 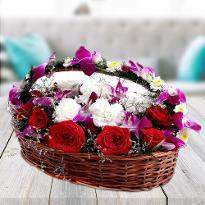 We also provide midnight flower delivery and same day flower delivery. Order for your special one from our exquisite range and let the scent of our anniversary flowers fill the fairy tale of your life with everlasting romance and eternal happiness. With bouquets like Ritzy aura, heart to heart, shiny emotions, radiant love, loving surprise and many more are ready to please one and all, be all set to delight your dear one with the sparkling surprise. 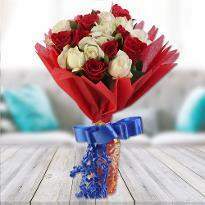 If you are planning to surprise your special one at midnight then you can opt midnight flower delivery. 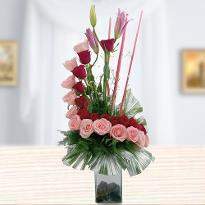 Flowers bring out the best in you by its scintillating beauty and mesmeric fragrance. 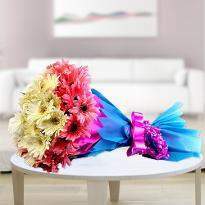 Get a hassle-free midnight bouquet delivery for your loved one from Winni. At the stroke of 12 a.m. the doorbell rings, a stunning bouquet of flowers will be received by your special one which surely wins their heart. You can couple flower with a mouth-watering cake to make the anniversary gift extra special. Anniversaries hold a great significance in everyone’s life. Whether it is a wedding anniversary or business anniversary, without any doubt you can gift flowers. 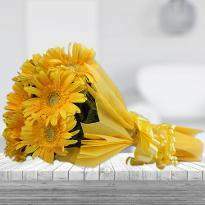 Flowers will be a gesture of affection, respect, warmth and all other generosities that are connected to basic emotions and invoke a side of us that might be very vulnerable to warmth and care. Flowers are always an addiction to those who strongly believe in the sharing of emotion. Flowers add fragrance in every celebration. 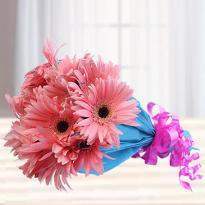 Different color of flowers symbolizes different meanings. 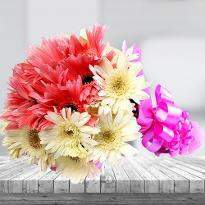 Winni offers a wide range of exotic flowers that you can order for your near and dear ones. A cake with flower is the best combination that you can gift to your near and dear ones on any occasion. Winni offers the facility of cake delivery along with a bouquet or basket of roses, orchids, carnations, lilies or gerberas. Some of the popular cakes are red velvet cake, fruit cake, pineapple cake, chocolate cake, strawberry cake, black forest cake, vanilla cake, photo cakes, eggless cakes etc can be clubbed with beautiful flowers. Celebrating happy time by delivering not only cakes but fresh enthralling flowers to your near and dear ones is what winni has been known for. Want to send cake and flower to your near and dear ones on their anniversary? Winni is just a knock away. We are an online brand who deals in delicious cakes, flowers, teddies and many more gifts that you can order online from here for any occasion. Just tell us how you wish to deliver the flowers, we would offer you delivery of flowers in different design and elegant wrapping. You can never go wrong with flowers on any occasion. You can easily make the payment of your order by using net banking, debit card, credit card, Winni wallet, Paytm PayPal. Love is just love, it can never be explained. It is a long journey of emotions, efforts and promises to make the eternal bond. Promises are the milestones that make the relationship fruitful forever. Keep the sparks alive in your relationship by adding colors of happiness. This anniversary let the happiness bloom in your relationship by creating special memories with delightful anniversary flowers. 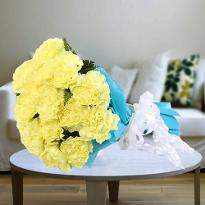 Get a hassle-free Anniversary flower delivery at the doorstep from Winni. The true essence of love is experienced by gifting something unique and beautiful like a bouquet of fresh flowers. Flowers are always associated with the purity. 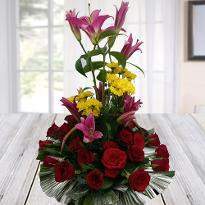 The beautiful flower arrangement will certainly let your feelings speak out. 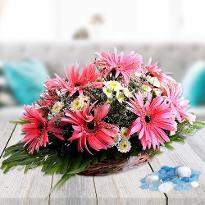 Fresh and elegant flowers tend to create a tranquilizing effect on everyone’s mind. 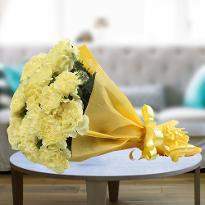 So if you want to surprise your special one, then simply these amazing flower bouquets from Winni will lift up their spirits and brighten up their day. Planning to surprise your husband on your anniversary? 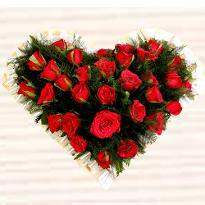 Go for heart shape arrangement of flowers as an anniversary gift. 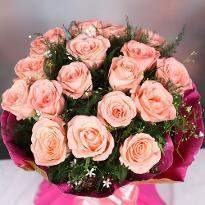 You can scroll down anniversary flower category to get the best arrangement of flowers of your own choice. 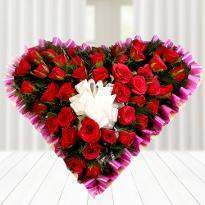 You can also choose double heart shape arrangement of flowers. Flowers are the best way to express the heart-melting emotions. 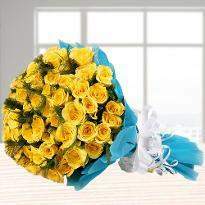 You can also send a personal message along with flower bouquet. So, don't wait and place your order now! Bangalore, Chennai, Bhopal, Indore, Patna, Kolkata, Delhi, Noida, Gurgaon, Ghaziabad, Hyderabad, Pune, Bihar sharif, Bijapur, Bilaspur, Bongaon, Botad, Brahmapur, Budaun, Bulandshahr, Bundi, Burhanpur, Buxar, Champdani, Chandannagar, Chandausi, Chandrapur, Chapra, Chhatarpur, Chhindwara, Chikmagalur, Chilakaluripet, Chilakaluripet, Chitradurga, Chittorgarh, Chittoor, Churu, Cuddalore, Dabgram, Damoh, Darbhanga, Darjiling, Datia, Davanagere, Deesa, Dehri, Deoghar, Deoria, Dewas, Dharmavaram, Dhaulpur, Dhule, Dibrugarh, Dimapur, Danapur, Dindigul, Dum-Dum, Durgapur, Eluru, Erode, Etah, Etawah, Faizabad, Farrukhabad, Fatehpur, Firozpur, Gadag-Betageri, Gandhidham, Sri-Ganganagar, Gangapur, Gangavati, Ghazipur, Giridih, Godhra, Gonda, Kanpur, Coimbatore, Surat, Vizag, Kochi, Agra, Varanasi, Mumbai, Ahmednagar, Ajmer, Ambala, Amritsar, Bhubaneswar, Dhanbad, Guwahati, Gwalior, Haridwar, Jaipur, Lucknow, Chandigarh, Ahmedabad, Dehradun, Nagpur, Raipur, Vadodara, Bareilly, Baripada, Barnala, Barrackpore, Barshi, Basirhat, Basti, Batala, Beawar, Beed, Begusarai, Belgaum, Bellary, Bettiah, Betul, Bhadrak, Bhadravati, Bhadreswar, Bhagalpur, Bharatpur, Bharuch, Bhatpara, Bhimavaram, Bhind, Bhiwadi, Bhiwandi, Bhuj, Bhusawal, Bidar, Bidhan-Nagar, Howrah, Jabalpur, Jagadhri, Jalandhar, Jammu, Jamshedpur, Jodhpur, Karnal, Kota, Ludhiana, Mangalore, Manipal, Mathura, Meerut, Mohali, Moradabad, Mysore, Nashik, Panchkula, Panipat, Patiala, Pondicherry, Ranchi, Roorkee, Aurangabad, Puri, Cuttack, Bikaner, Vijayawada, Faridabad, Aligarh, Allahabad, Amravati, Bathinda, Bhilwara, Bhiwani, Gandhinagar, Gaya, Gorakhpur, Guntur, Haldwani, Hisar, Hoshiarpur, Hubli-Dharwad, Jalgaon, Kapurthala, Kolhapur, Muzaffarnagar, Nanded, Rajkot, Rewari, Saharanpur, Shimla, Sonipat, Thane, Trivandrum, Udaipur, Udupi, Ujjain, Vellore, Calicut, Warangal, Madurai, Solapur, Akola, Anand, Bokaro, Bhavnagar, Firozabad, Tundla, Trichy, Kalka, Kharar, Nagercoil, Navi-Mumbai, Bhilai, Goa, Panvel, Rajpura, Ropar, Sahibabad, Salem, Sambalpur, Sangli, Solan, Tarn-Taran, Zirakpur, Purnia, Puruliya, Raebareli, Raichur, Raigad, Raiganj, Raigarh, Rajahmundry, Rajapalayam, Rajarhat, Rajnandgaon, Rajnandgaon, Rajpur-Sonarpur, Ramagundam, Ramagundam, Rampur, Ranebennuru, Raniganj, Ratlam, Raurkela, Rewa, Rishra, Robertsonpet, Rohtak, Sasaram, Satara, Satna, Sawai-Madhopur, Secunderabad, Sehore, Seoni, Serampore, Rudrapur, Sagar, Saharsa, Sambhal, Santipur, Shahjahanpur, Shivpuri, Sikar, Silchar, Siliguri, Singrauli, Sirsa, Shamli, Shikohabad, Shillong, Shimoga, Sitapur, Siwan, Tadipatri, Srikakulam, Srinagar, Aizawl, Akbarpur, Alandur, Kurichi, Kurnool, Lakhimpur, Lalitpur, Latur, Loni, Machilipatnam, Madanapalle, Madavaram, Madhyamgram, Mahbubnagar, Maheshtala, Mainpuri, Malda, Malegaon, Malerkotla, Mandsaur, Mandya, Mango, Maunath-Bhanjan, Medinipur, Mehsana, Mira-Bhayander, Miryalaguda, Mirzapur, Modinagar, Moga, Morbi, Morena, Motihari, Mughalsarai, Muktsar, Munger, Murwara-Katni, Muzaffarpur, Nabadwip, Nadiad, Nagaon, Nagapattinam, Nagaur, Nagda, Naihati, Nalgonda, Nandurbar, Nandyal, Narasaraopet, Navsari, Neemuch, Amravati, Adilabad, Adoni, Agartala Ambattur, Ambernath, Ambikapur, Ambur, Amreli, Amroha, Anantapur, Anantnag, Arrah, Asansol, Ashokenagar-Kalyangarh, Avadi, Azamgarh, Badlapur, Bagaha, Bagalkot, Bahadurgarh, Baharampur, Bahraich, Baidyabati, Alappuzha, Alwar, Abohar, Achalpur- Kamarhati, Kanchipuram, Kanchrapara, Karaikudi, Karimnagar, Kasganj, Kashipur, Katihar, Khammam, Khandwa, Kharagpur, Khargone, Khora, Khurja, Kishanganj, Kishangarh, Kolar, Kollam, Korba, Krishnanagar, Kulti, Kumbakonam, Balasore, Ballia, Bally, Balurghat, Banda, Bankura, Bansberia, Banswara, Baran, Baranagar, Barasat, Baraut, Bardhaman, Gondal, Gondia, Greater-Noida, Gudivada, Gulbarga, Guna, Guntakal, Habra, Hajipur, Haldia, Hajipur, Haldia, Halisahar, Hanumangarh, Hapur, Hardoi, Hassan, Hathras, Hazaribagh, Hindaun, Hindupur, Hinganghat, Hoshangabad, Hospet, Hosur, Hugli-Chinsurah, Ichalkaranji, Imphal, Jagdalpur, Jalna, Jalpaiguri, Jamalpur, Jamnagar, Jamuria, Jaunpur, Jehanabad, Jetpur-Navagadh, Jhansi, Jhunjhunu, Jind, Junagadh, Kadapa, Kaithal, Kakinada, Kalol, Kalyan-Dombivali, Kalyani, Nellore, Neyveli, Nizamabad, Ongole, Orai, Osmanabad, Ozhukarai, Palakkad, Palanpur, Pali, Pallavaram, Palwal, Panihati, Parbhani, Patan, Pathankot, Pilibhit, Pithampur, Porbandar, Port-Blair, Proddatur, Pudukkottai, Sujangarh, Sujangarh, Sultanpur, Surendranagar, Suryapet, Tadepalligudem, Tambaram, Tenali, Thanesar, Thanjavur, Thoothukudi, Thrissur, Tirunelveli, Tirupati, Tiruppur, Tiruvannamalai, Tiruvottiyur, Titagarh, Tonk, Tumkur and many more.